Since the Dawn of primeval man, when Cro-Magnon first discovered that he could alter his consciousness by beatig himself over the head with his club, man has sought many paths to euphoric enjoyment. Some have involved religion or meditation, others drugs. 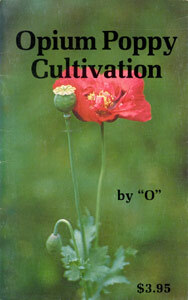 Along this line, opium has long been one of man's favorites. It is not only enjoyable, but it relieves the pain of clubbed heads. Much of the information contained in this book is illegal to put into practical usage in the United States, Canada and most other western nations, except under government license. Specifically cultivation or possession of all parts of the plant, Papaver somniferum (except possession of the seeds) is illegal under federal law. We are in no way attempting to encourage illegal activity. Our purpose in publishing this work is solely to contribute to mankind's collective knowledge, and to help increase our understanding of man's complex relationship with nature. The author and publisher assume no responsibility for the safety or legality of practical use involving any information given in this book.